Get ready for the season with this free crochet pattern for a water bottle cozy. ‘Coz, now that it’s sunny, you might want to swap your coffee cup cozy for one to carry your water bottle. This is a free crochet pattern for an adorable bottle bag, that will make you want to take your water along, wherever you go, just to show of the bag you’ve made! 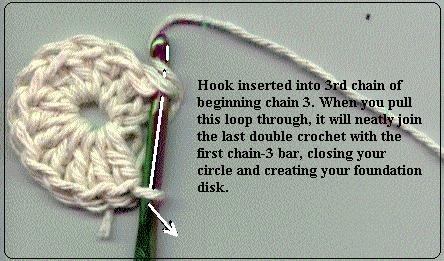 Plus, it is a tutorial on how to crochet. 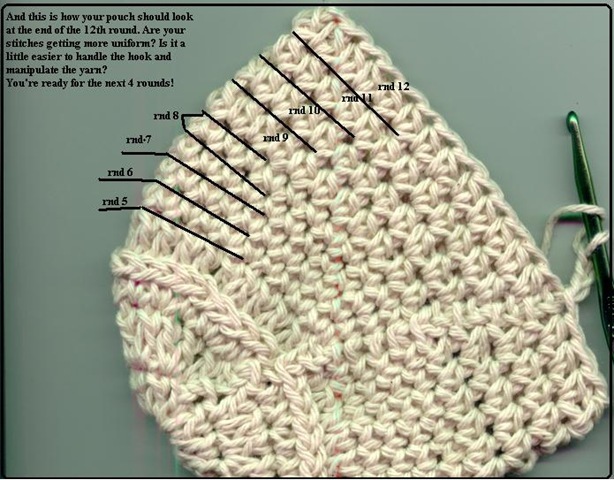 This is what’s great about this free crochet pattern. 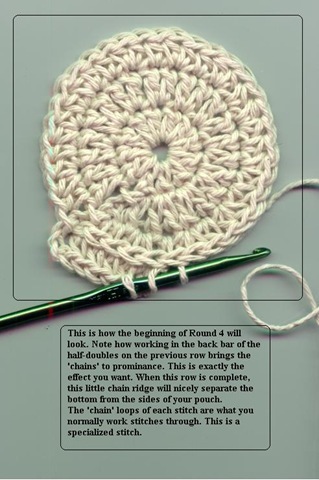 It comes with a wonderfully detailed, illustrated tutorial that has instructions in ‘Crochet’- language and has crochet directions in plain English. 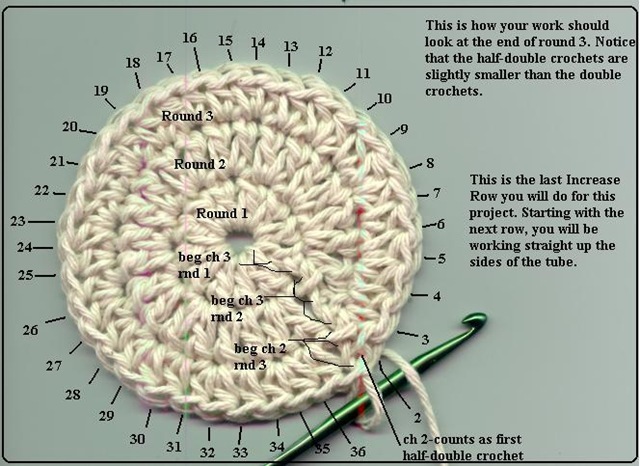 These factors makes this an ideal project to learn to crochet. Let’s get to crochet your personalized water bottles. Cotton/wool yarn, e.g. 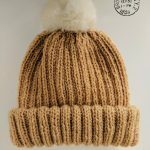 Can be made in Sugar’n Cream 100% Cotton Yarn or in Lion Brand Fishermen’s Wool Yarn . (Note: this wool yarn is slightly finer than the cotton). 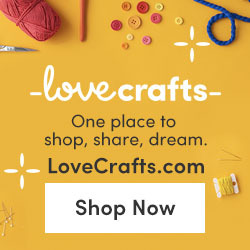 Browse around a little to get the yarn you really like . Tip: Using a uniform yarn that allows you to easily see the patterns you’re learning to crochet. Even yarn also allows you to observe how even your stitches are. GAUGE: This pattern is assuming a fairly loose crochet, to loosely fit your bottle, your keys, some change, and perhaps even a lipstick. Ha! Tip: If you crochet tightly, this pouch will be snug around your water bottle. However, if you’re REALLY tight, it will fit loosely around a soda can or make a nice little license/money pouch. So, adjust the pattern to upsize it as desired. In this Free Crochet Pattern Water Bottle Cozy – tutorial, you will see two sets of instructions. The first set is how you would see this pattern written out in a book or pattern magazine. Below that, in plain English (or as close as I can get and still be speaking ‘crochet’) is the translation. I suggest reading through both, and taking the time to see how the ‘plain English’ version relates to the pattern terminology. 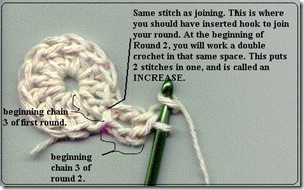 Make 11 double crochets in that big loop. Now count the outside loops of your beginning chain. You should have 3 of them. Slip stitch into that 3rd loop. (How to slip stitch video below). This will close your beginning ring, and give you a solid foundation to work off of. 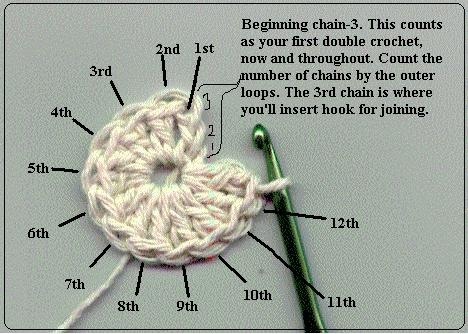 Now, when you count your stitches, the beginning chain 3 will count as one double crochet. When you count, you will have 11 stitches and the 3-chain bar. This counts as 12 completed double crochets. 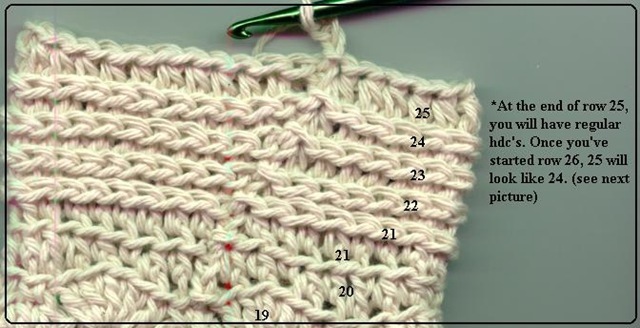 If you don’t have the right number of stitches to begin with, the entire pattern will be skewed. 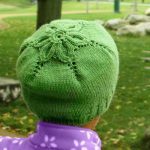 This is not as critical if you are using only one stitch, but if you choose to get fancy with shells or other patterns, having the right number of foundation stitches is crucial. Round 2: chain 3. This will count as your beginning double crochet. Now, in the same loop as the joining, work a double crochet. You now have two stitches in the top of the stitch from the previous row. This is also known as an INCREASE. In the next stitch from the previous row, work 2 more double crochets. Do this all the way around. When you get to the end of the row, count to be sure that you’ve only worked 24 double crochets (don’t forget the beginning chain in that counting!) 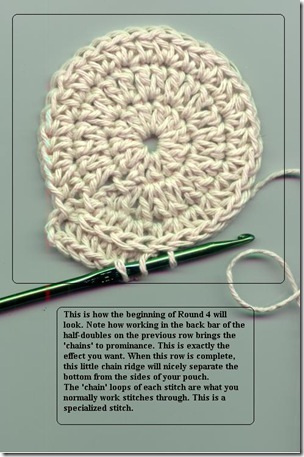 Now, join the last double crochet to the top of the beginning chain 3, as you did before. Round 3: chain 2. Work a half-double crochet in the same stitch you just joined into. 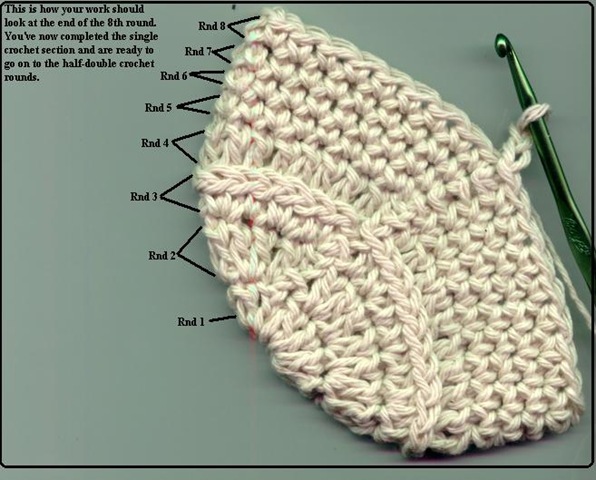 Again, this gives you a little V.
Now work a half-double crochet in the next stitch. Work two half-doubles in the following stitch, and one in the stitch after that. Keep doing that until you’ve worked your way around. Now join as before. Seeing a pattern here? You should now have a total of 36 stitches, including the beginning chain-2. Rnd 4: ch 3. Working in the back stitch loop of each hdc, work one dc in each stitch around. Join with sl st to top of beginning ch. Now we’re going to get tricky! This is where you stop increasing and just go straight up to form the sides of your tube. You don’t HAVE to get fancy with this part, but I like the affect. Round 4: ch 3. Now look at the back of your stitches. You have the top two loops, which are what you normally work in. There’s a little bar right below the back loop on a half-double crochet. It’s a bit of getting used to, but once you’ve learned how, this creates a very nice little side-ways chain stitch. Now, wrap your yarn around your hook, just as for a regular double crochet, then insert your hook from the front to the back, through that little bar. Draw up a loop. Wrap around and draw through two loops, wrap around and draw through the last two loops on the hook. Now look at your work from the front. See the little chain? That’s what you’re going for. You’re still working a double crochet, but in a different place than before. Continue doing that around to the end. Join as before. You should now have 36 stitches. If you don’t, either take one out, or look carefully at your work. You may have put a stitch in the beginning chain spot, making an increase there. No need to tear out your work. Just undo the last stitch made, then join. You’ll have a little space there, but that’s okay for a practice piece. 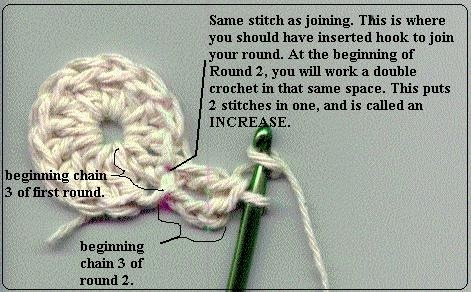 Work a single crochet in the same stitch as the joining chain. Now work a single crochet in each stitch around. Join with a slip stitch to the first sc. 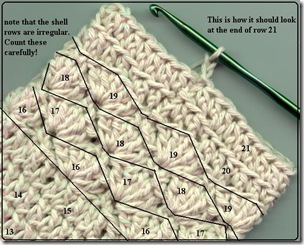 Join at the end of each row, but work a total of four rows in single crochet. 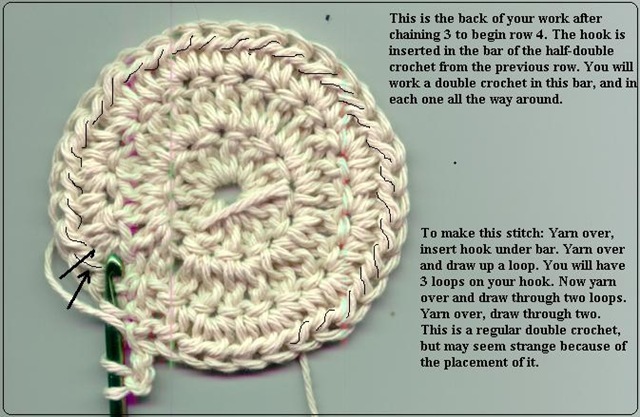 This should give you some decent practice at single crochet. 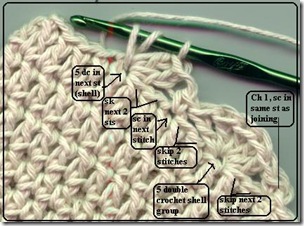 a single crochet is the ONLY stitch that you will put into the same stitch as joining when you’re NOT increasing. It can be confusing, but that’s how it works. chain 2. 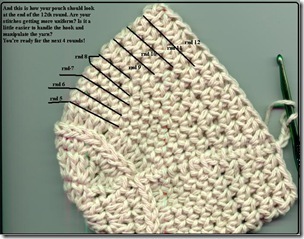 Work a half double crochet in the next stitch (not the same stitch as the joining!) Now work one half double crochet in each stitch around. 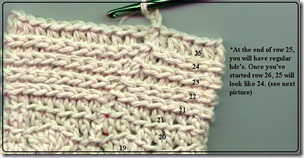 Join with a slip stitch to the top of the beginning chain 2. * ’Work even’ means that you won’t increase or decrease for that amount of rows. You’ll see this a lot in patterns, which is why I am giving you a reference here. chain 3. 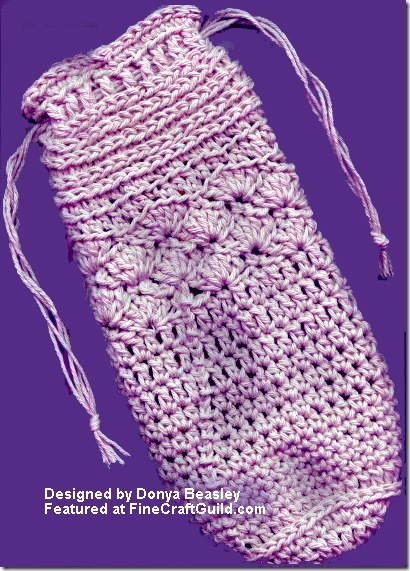 Work a double crochet in the next stitch, and then work one double crochet in each stitch around. Join to top of the beginning chain as before. You should have 36 double crochets, counting the first chain-3. Now do that for a total of four rows. Chain 1. Work a single crochet into the same stitch as joining. (this is not an increase, if you recall.) now leave the next two stitches unworked (skip two stitches). In the third stitch from the one you just made, work 5 double crochets. As you work them, they will fan out. NOTE: if you work these too tightly, the whole pouch will pucker here. Now skip two stitches and in the third stitch, work a single crochet. Skip two stitches, work 5 double crochets in the next stitch. See the ripple effect? That’s what you’re trying to do! Good job! Continue this around. 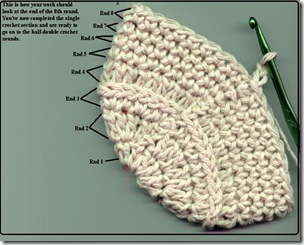 Join with a slip stitch to the beginning sc. 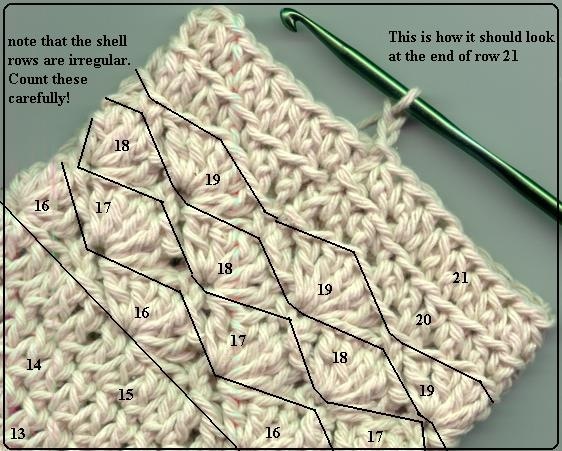 You should now have a total of 6 shells with a single crochet between each shell group. This fancy & impressive crochet shell pattern may appear hard, but it’s easy & quick. It is impressive, though, which is why I use it. sl st to top of shell. Ch 1, sc in same st, sk two dc, 5 dc in next sc. *sk 2 dc, sc in top of shell, sk 2 dc, 5 dc in next sc. Repeat from * around. slip stitch in the next 3 stitches. 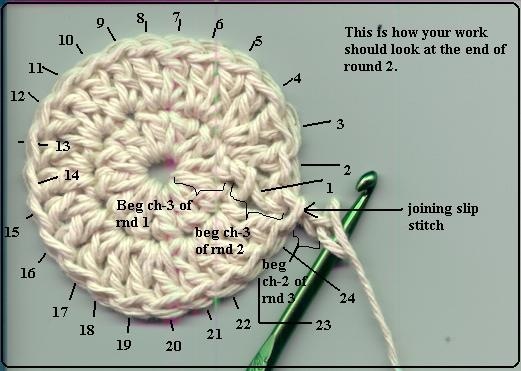 This will put you in the 3rd double crochet of the shell, or the ‘top of the shell’. Now chain 1 and work a single crochet in this same stitch. Skip the next two double crochets, and work 5 double crochets, or a ‘shell group’ into the next single crochet. This fills in the little valley from the previous row quite nicely. 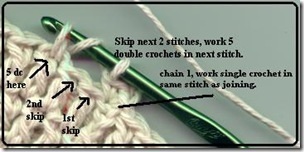 Now skip the next 2 double crochets and work a single crochet in the next stitch. Continue this pattern around to the end. You should have worked 6 shell groups. Now slip stitch into the beginning chain-1 to finish this row. ch 3. Working in BLO of previous row, *hdc in each of next 2 sts. Sc in stitch at top of shell, hdc in next 2 sts, dc in next st. This is easier than it looks. Look at the top of the stitches from the previous row. 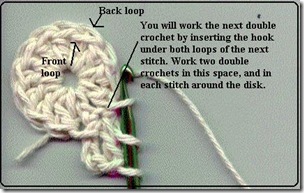 Usually, you’re working each stitch under both loops of the ‘chain’. This time, you’re going to work only in the back loop of the stitch. This will leave a small ridge that makes a nice dividing line between pattern stitches. Be careful not to pull too tightly when working the stitches, or you’ll distort the row. Chain 3. (This counts as your beginning double crochet. 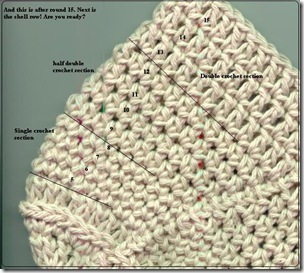 Notice that it is worked in the top of a single crochet from the row below. That’s important, because with this row, you’re going to be evening out the ripples to make a nice flat working area for the next row. )Now work one half-double crochet in each of the next two stitches. You should be at the top of the shell now. Work a single crochet into the stitch there. Work one half-double crochet into each of the next two stitches. 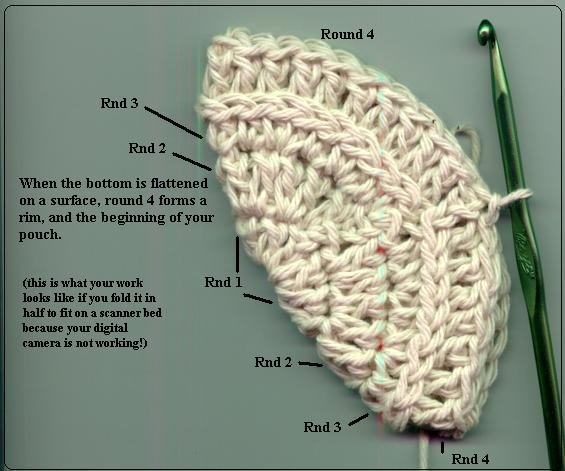 This puts you at the bottom of the ‘valley’ between shells, and you’re going to work a double crochet into the single crochet there.See the pattern here? Double crochets get worked in the sc from the previous row, single crochets get worked in the top of the shell, and half-doubles go between.When you get to the end of the row, you should end with the last two stitches as half-double crochets. Join with a slip stitch to the top of the beginning chain 3.
chain 2. 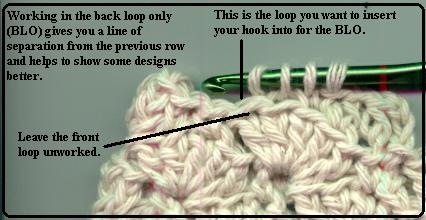 Again, working in the back loop only, as in the previous row, work a half-double crochet in the next stitch. Do this all the way around, and join with a slip stitch into the top of the beginning chain 2. You should have 36 stitches. Chain 2. Okay, remember what we did to start forming the sides of the tube? The pretty chain-like stitches on row 4? We’re going to do the same thing here. Work a half-double crochet in the bar in back of each half-double from the previous row. Work this around to the end. 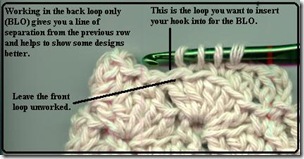 Join with a slip stitch to the top of the beginning chain-2. You should have 36 stitches at the end of each row. Chain 3. 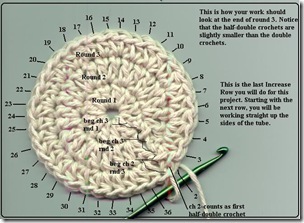 Remember this counts as your first double crochet. Now, working in the back bar like in the last row, work a double crochet into the back of each half-double crochet around. 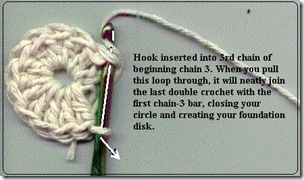 Join with a slip stitch to the top of the beginning chain-3. You should have 36 stitches. 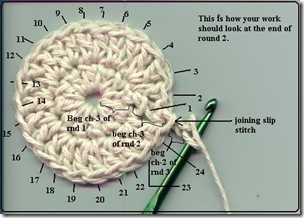 NOTE: round 26 is the row you will weave drawstrings through, if you’re going to use them. Chain 1. Now working in the back loop of the REGULAR stitch, work one single crochet in each stitch around. Join with a slip stitch into the first single crochet made. You should have 36 single crochets. sl st around. Finish off. 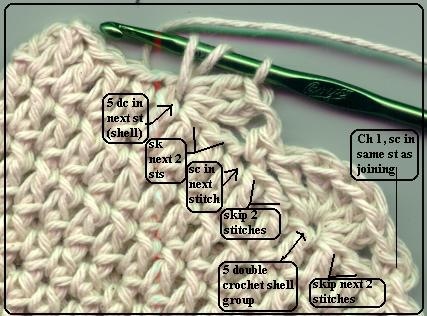 Slip stitch into each single crochet around. At the last stitch, slip stitch to join, as you normally would. Snip the yarn a few inches past the joining, and then draw yarn through the last loop on your hook. You now have a loose end. Weave it in. This row is not absolutely necessary. I just think it gives the pouch a ‘finished’ look. 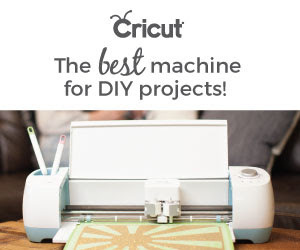 If you wish, you could line this project with a pretty inside fabric. Here are some fabric ideas that will blend really well with simple off-white of this crochet bottle bag. If you wish, you could crochet and attach a handle, or an over the shoulder sling to the bag. Crochet a cord, or use the same fabric as the inner lining. 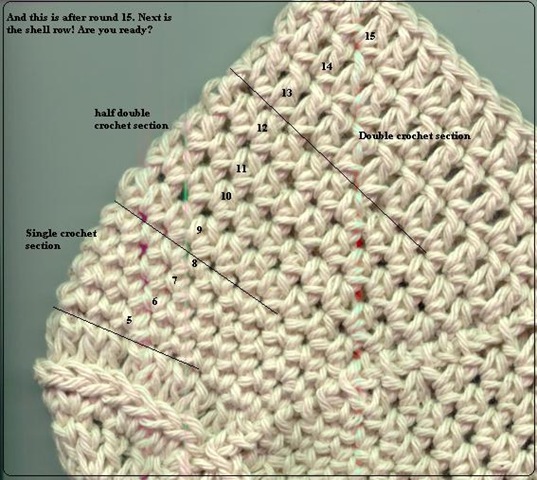 This crochet tutorial is so detailed that it is actually become fairly easy to make your own design changes. Make the bag longer or shorter. Add colors and whimsy to it, as it pleases you. 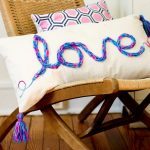 Go wild: use different yarn and hooks…. I wonder how this would look when made out of paper yarn and a huge hook. Probably a quite amazing home decoration piece! Or transform it into a really fine work and add beads, ribbons and studs to make this into a divine pyjama bag for a niece’s doll. 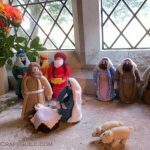 Many, many, many thanks to the wonderfully funny veteran crochet artist and teacher Donya Beasley who is sharing her decades of crochet experience with us in detailed pictures and plain English ‘translations’ of crochet speak! 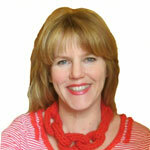 Donya has been teaching crochet in the Arts & Science Department at the University of Atlanta. This si such a cute project and I love the pictures it makes it so much easier to understand! Great tutorial! 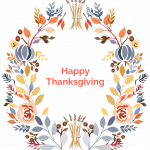 Thanks for linking up with Sugar & Spice. Great tutorial! 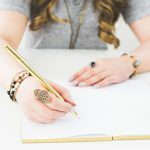 Thanks for stopping by my blog, and thanks for the tip on opening up the comment section. . . I really appreciate it!!! Hi, I am really having trouble with Round 3. Please rush! help! I need to make it within the next couple of days. No panic. We’re here… What exactly is the problem? Ok, I must be a complete dope! I try to follow this really close, however, mine keeps rolling up! It won’t lay flat like the pictures. I don’t know what I am doing wrong! Help me, please….. I purchase one of these, but since my caner I need to carry water every where and it is the best. It would be awesome if I could make my own. You are brave to start something new, and so by that mere fact you are not a ‘complete dope’. 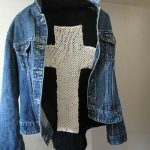 While this is a ‘learn crochet’ project, it has a variety of stitches in it and while easy, it is not SUPER easy. So, give yourself some credit, and let me see if I can help you. First of all, ‘the problem’ might not be a problem at all. So what if it rolls up? 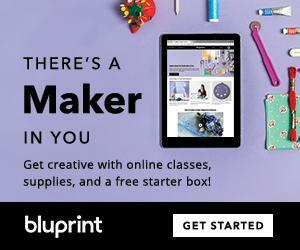 Does whatever you have produced so far fit your water bottle? I am guessing that you are using lighter yarn than used here, and possibly you are crocheting tight. And that one or both of these factors make your project curl up while you are working on it. If the curling up bothers you, try crocheting a bit looser. 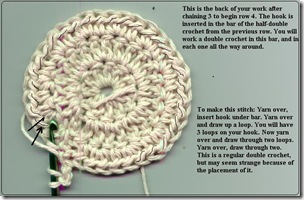 An easy way to do this is simply use a little bigger crochet hook than you are using now. Let me know how it turns out and do send in a picture!